Salt Life & Clemson | Just A Guy Talking About Life, Kids, football. And Probably Beer. Wow..it’s been awhile since I’ve sat down and written one of these. Lots has happened since my last post. We’ve seen DMB 2 or 3 more times. The Red Sox won the World Series. Bookwork is driving a car with a license and has a job (kinda scary!!). We rode out a very strong Category 1 hurricane. I took a new job. And best thing…Clemson has won two (2) NATIONAL CHAMPIONSHIPS in college football. So I’m going to slowly get back into this writing thing…see where the whims take me. So I hope this blog post finds you healthy and well, and look for a few more of these from time to time. The day is here. We are off to the Dave Matthews Band concert tonight in Raleigh. This will be our 25th + show (I actually lost count). Tonight will be a great show with great friends. 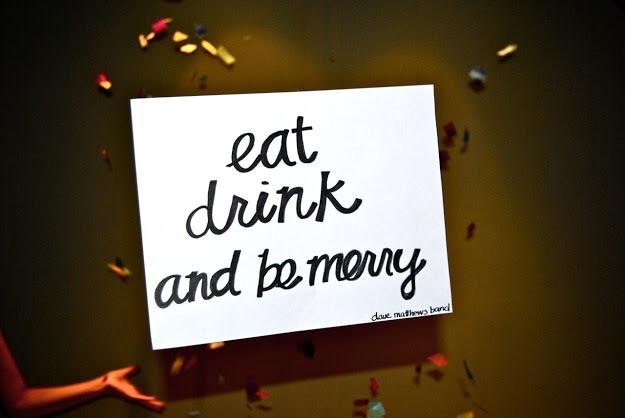 Have a great Holiday weekend! What are you doing to start your holiday weekend? I’ll start with Saturday. It was the end of the STRIDE season for us. It ended with the OrthoWilmington 5k for our STRIDE team that I help coach with my wife, Kelli. 10 weeks and 20 practices have gone by since we started this journey with 20 amazing boys in grades 3-5. Some of them started with little or no running experience at all. Saturday the majority of them completed their first 5k of their lives, completing a journey that brought joy, tears and lots of sweat. They did an amazing job completing the race and meeting their goals. Times didn’t matter this day, it was all about the journey and completing the race. Statman had never run a race before, other than a 1 miler here and there. His last 1 mile race was in March, where he pulled out a 6:21. During the season leading up to this 5k, Statman showed signs of speed and distance, leading us to have no clue what he would do for this race. We started out at a slow pace, as he was instructed. During the season, we continuously reminded the kids to “pace themselves”. Statman did. Close to a 10 minute pace for mile 1. He then cranked it up. We hammered mile 2 and most of mile 3 at about an 8 minute pace. We hit the final turn to finish the .1, and Statman had nothing left. 27:34 was his time. What a great run. He gave it his all and felt very proud of his race. And he should. What a great race, and I’m so very proud of him for his effort. Great work booboo! 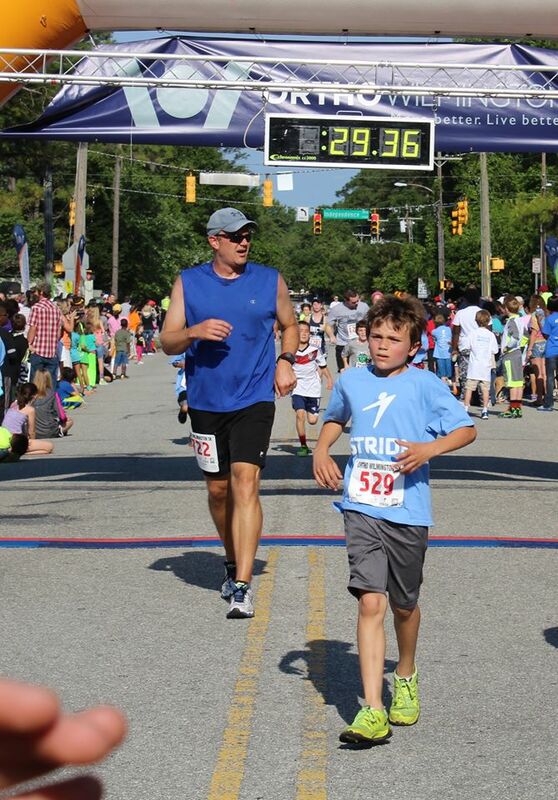 Statman finishing his first 5k (STRIDE boys started 2 minutes later than clock time). What a great first 5k time of 27 + minutes. Then a few hours later on Saturday afternoon, we had our last soccer game of the season for Bookworm. This was his first year playing soccer. He was very excited to play when the season started, although he had never played before. He played in the field for the 1st half of the first game of the season. He was then placed in goal. He remained there for the balance of the season. He had never played soccer before, better yet goalie. He did an amazing job at goal. He made some amazing stops. He had to, his team was outshot about every game 40-5. He didn’t stop them all, but he did stop a lot of them. He gave his all to the position and to every game. Frustrations and tears game, but he overcame and finished strong. The last game of the season his team won 4-1. A great performance by him, and they ended on a high note. He hasn’t decided if he will play soccer again, but I will support whatever he wants to do. He handled the ups and downs with such class and character. Great job buddy! Bookworm kicking it out of goal…what a Great Goalie he has been in his first year of soccer..
Sunday morning came way to soon (4:00 am alarm clock call), as Kelli and I got her stuff together and headed out to Carolina Beach for her first sprint triathlon. This was a double sprint, with a swim, run, bike, run and swim again. She had never done a sprint before, and only 1 other triathlon to date (1/2 Iron distance triathlon), so she was quite nervous. She had never really swam 2 years ago. She could enjoy the water, but to define her swimming as with true form, she would argue there was none. But today, she can swim. And she can swim well. 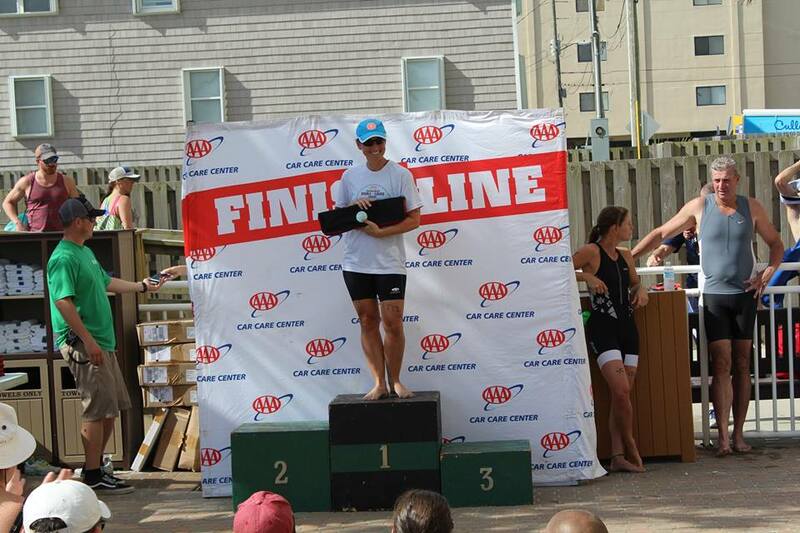 She ran into the ocean and completed her first leg of the triathlon with ease. Well, she made it look easy, whether it actually was or not. 1:27:54 later, she finished her first sprint triathlon. She finished 1st in her division (Masters Novice Female), and would have placed in other divisions as well. She overcame some fears and just built confidence in preparation for her EPIC IM in November. She will rock it just like she has any other challenge that she has taken on. She is amazing, and I’m so very proud of her for her dedication and work ethic. Great job babe!! First on the podium for Masters Novice Female. Excellent job babe!! And today, this morning, at 8:30am, was the topping to the cake. My wife, the amazing leader and coach there is, presented the coaches of the UNC-Wilmington Track and Field and Cross Country teams, with a check for $7,800, as a donation to help support the UNCW TFCC team and keep them competing. See, a few months ago, the University decided it was going to cut these programs due to “funding and Title IX” issues. Not sure what the true motivation was, but this was not acceptable. A campaign was started by the University team and the public to raise money. The requirements were set: 1) Raise $250,000 by May 31 to allow the team to compete in 2015-2016; and 2) raise another $800,000 in order to renovate the existing facility and upgrade. Challenge accepted. The public went out and began collecting donations and pledges to keep this program from being eliminated. My wife, being such a lover of running and supporter of everything running, had a little idea for the Bellamy Elementary Stride boys’ community service project: HELP UNCW SAVE THEIR RUNNING PROGRAMS. With the help of so many people and the support of the school, PTA, teachers, kids, and their parents, this idea grew, and the Bellamy student body were all invited to participate. Two weeks ago at the school, we had a running event to collect donations and pledges. 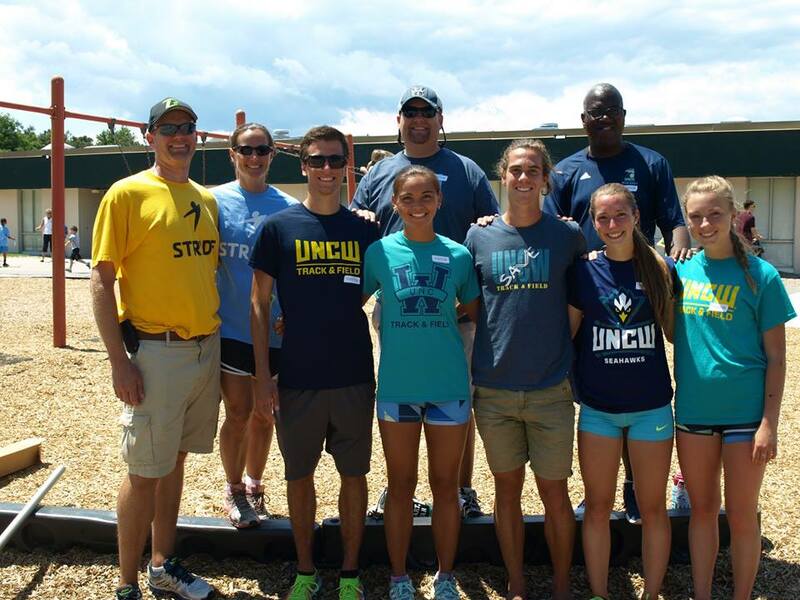 The UNCW coaches and athletes came out to help support the kids, and it was a successful event. We never knew how much we could raise, and had in our minds maybe $1500-$2000 could be raised. None of use expected what did happen. So, this morning, at about 8:40 am, we were able to meet the coaches, and in the presence of the entire Bellamy student body, my wife presented them with a check for $7,800. Truly amazing!! She is such a leader, motivator and an all around amazing person. The University still has a ways to go to meet their immediate goal, and we think they will make it, and today provided that hope that it will and all will be right, at least for now. 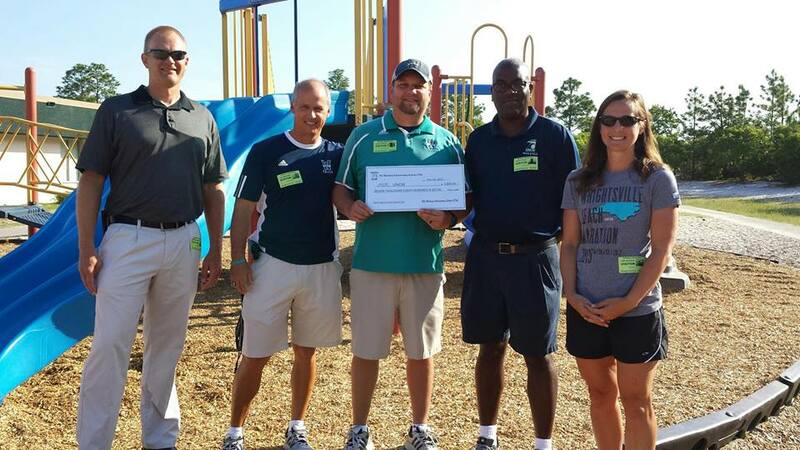 UNCW Coaches with Coach Kelli and myself and their donation check. What did you do this weekend? What are you planning to do? If you care to help with this effort, message me for more info. Lots of big happenings in the next few weeks for us, but for today, we are going to take a rest and enjoy the great day it has been. Last Thursday night we had a little league baseball game for Statman. He plays 9u kid pitch baseball. He really enjoys it, and is getting better as we practice more and the season continues. Last season was an epic fail, mainly due to the league, as the talent level was very poor in that league. We decided to switch leagues this year and give it a try, as we heard from numerous sources the talent level was much better. Well, it is. A step or two above. Statman plays on a team with 3 travel ball players, and they are at the top of the league talent. Statman is average, or above average, but not to their level. No fault to him, we just don’t practice enough. We had a game Thursday night. The team was trailing 10-6 in the bottom of the 5th. Last at bat for the team. Statman was 3rd to hit this inning. Batter 1 struck out. Batter 2 grounded out. 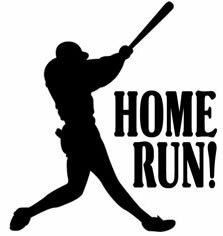 Statman came to the plate, ripped a line shot down the 3rd base line. The ball rolled to the fence, past the leftfielder. Statman rounded 2nd on his way to third as the left fielder picked up the ball and threw it to towards third. Statman rounded third (with a HUGE smile on his face) as coach waved him home. Shortstop took the relay and launched it home, just to the left of homeplate. The catcher reached to make the play, but Statman just touched homeplate before the catcher could make the tag. Inside the park Home Run! Statman was hugged by all his teammates. 10-7. Rally time. Next batter struck out, game over. Saturday brought a short shakeout run for me prior to my 1/2 marathon on Sunday morning. Then we headed to the soccer fields as Bookworm had 2 soccer games, about 1 hour apart. Bookworm played goalie again this game, stopped about 30 of the 35 shots that were fired at him. Some of the saves could have been put on ESPN Sportscenter Top 10 plays. Game 1 – Loss 5-0. Game 2 came about an hour or so later. Bookworm was put back in goal again. 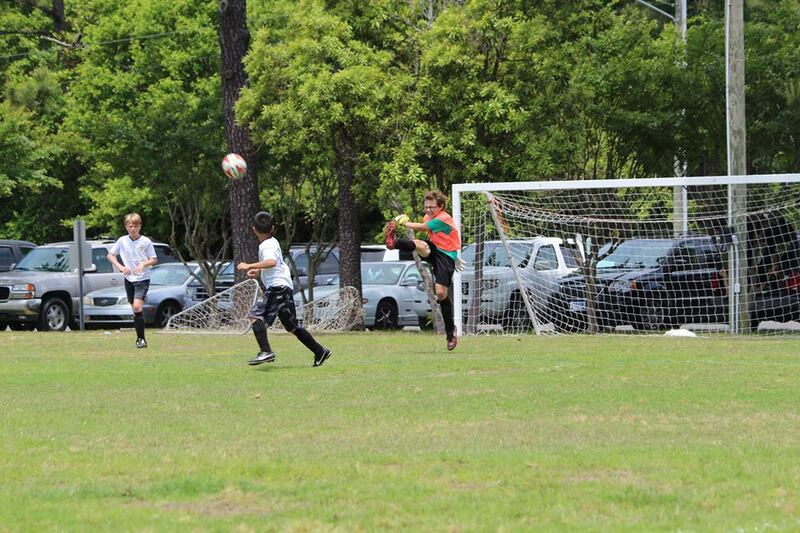 He asked coach if he could play in the field, but coach said he was doing too well and he needed to stay in goal. 6o minutes and about 45 shots later, the 2nd soccer game ended in a loss, 6-1. As a comparison, the opponents’ goalies, both games, probably had a combined 10 shots on goal. Compare that to Bookworms rapid fire assault, with about 40 to 50 shots on him per game. Can anyone say “Defense”? One week left of this soccer experience for Bookworm. We shall reassess his soccer playing days after next week. He’s done awesome and we’re so very proud of him, just wish it was a different experience. Sunday morning was my marathon. I was up at 4:45am to make sure I had my pre-race meal, and get all the jitters out of my stomach before the race. Good thing I got to the race location with an hour to spare, as the jitters worked them selves out several times. The race started at 7:30am under sunny skies and cool temperatures. The course was a double loop course, split in the first 1 to 2 miles of each leg by a 1/3 mile boardwalk through a forest. Nice and cool. My goal time was a sub-2 hour 1/2. I ran this race last year, same route, in 2:05 +/-. I didn’t train near enough for it last year, as we spent a couple weeks prior to it in Boston and Washington, DC. I’m not making excuses, I just didn’t run. Focused on many other things other than running. I hit the turn-around at about mile 6 feeling really good. It was still fairly cool out. I was at about an 8:30 to 8:45 pace. I didn’t know exactly, as my garmin jumps from 7 minutes to 10:30 in about 10 steps. I had some times written on my arm to keep pace, and I was ahead of these times. So I felt pretty good. I came out of the forest at about mile 7 1/2. 4 miles of asphalt running until the homestretch. I started to feel my legs getting heavy about mile 10, but knew I was moving pretty good and needed to keep pushing. I passed one guy running in a kilt (yes, a kilt), at about mile 9, and he said “either I’m slowing down or you’re speeding up”. My response was a flat “I’m not sure what I’m doing”. I hit the boardwalk for the last run in the cool and then the long home stretch up the main drive to the finish line. I came out of the woods and hit a curtain of heat. I think in that 1/3 mile stretch through the woods the temperature went up 10 degrees. I came out and it was quite warm. I wanted to stop running, but knew I couldn’t. I had a goal, and I had a need to finish this race strong. I told my coach what I wanted to do, and this was my coach’s first training plan for someone other than herself, so I had to give it my all. I finished the long stretch to the finish line and was pleased to meet beat my goal time. Finish time 1:52:26. I crushed my 1/2 PR by over 12 minutes, on the same course, and even won 1st place in my age group. I was thrilled. Thanks to my coach, aka Wife. There is something to say about small races. 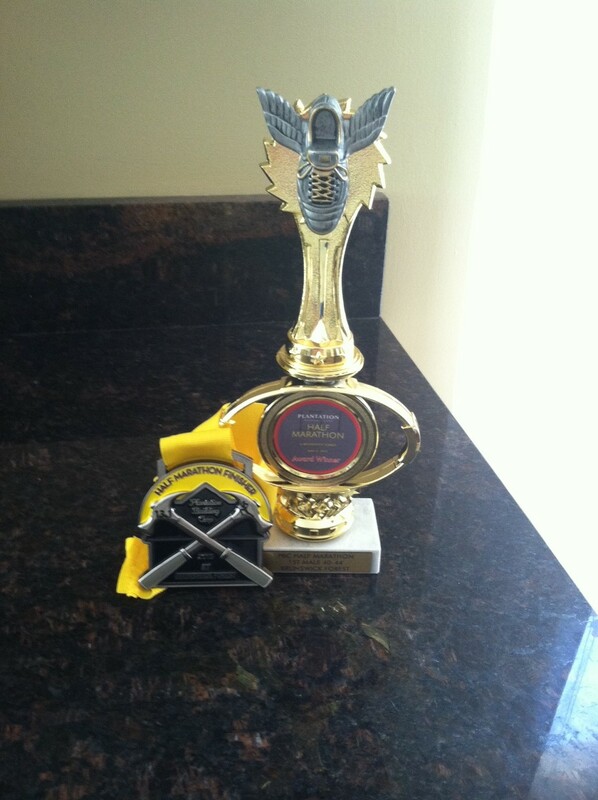 My finisher medal and 1st place age group trophy! We spent the rest of Sunday afternoon working in the yard, doing some yardwork, including mowing, edging, and stick/pine cone clean up. 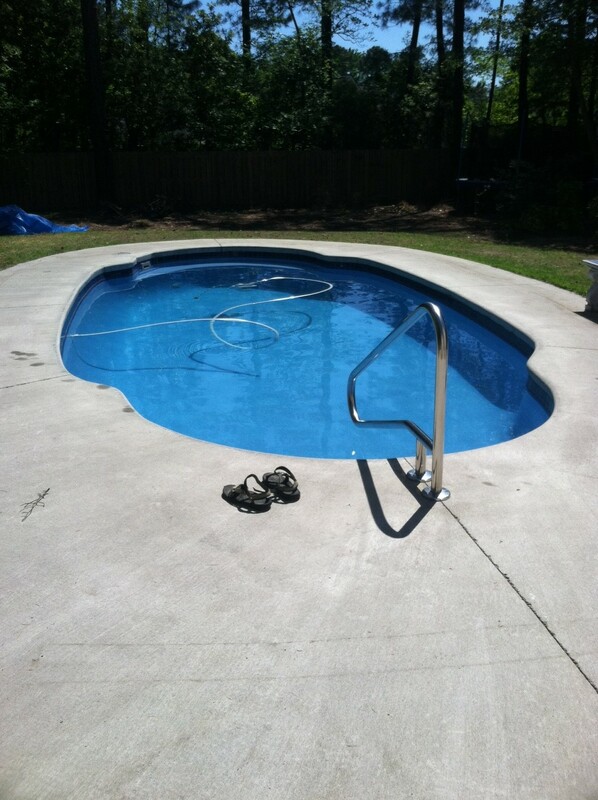 We also pulled the covers off the pool, put the vacuum in, scrubbed the walls, and cleaned the deck around it. Getting it ready for summer. It warmed up to 73, but not enough for Bookworm to jump in. He tried, but could only make it in about thigh deep. It looks awfully enticing to jump into, but still too cold. I didn’t get in last year unless it was above 80. We had some trees removed in the backyard in April to add about 3 to 4 more hours of sunlight a day on the pool, with the target to get more sunlight = warmer pool = more use. Well, let me rephrase, more adult use. The kids can handle the pool at 75 degrees and above. Wife and I = 85+. I’m hoping a long week of sun and 80’s will have this pool nice and warm come the end of the week. Fingers crossed. Monday brought our big fundraising event at Statmans’ elementary school. More to come on that, but you can read about some of it here on my wife’s page. And a busy week of kid sports, concession stand work, grandparents’ visit, and Mother’s Day! What do you have planned for this week? What did you do over the weekend? Any big accomplishments recently you want to talk about? Yes, that’s right. It’s DMB time baby! 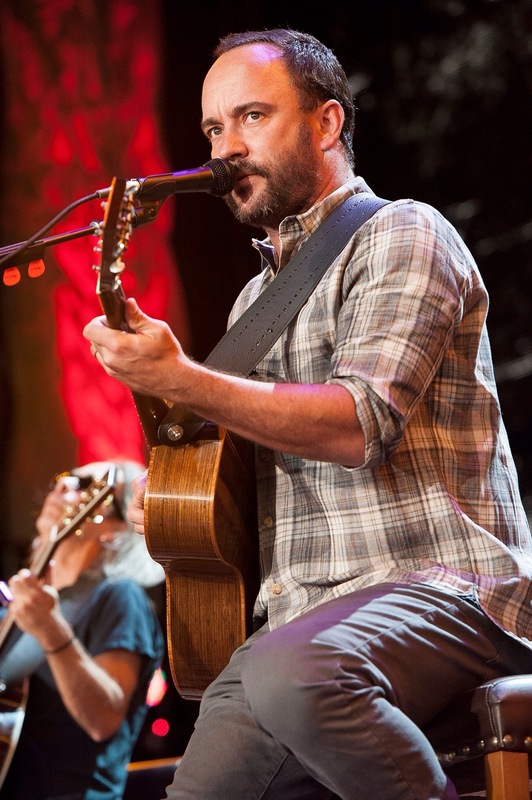 Three weeks from today, Dave Matthews Band will be in Raleigh at Walnut Creek Pavilion for the 2015 tour. We have tickets, and CANNOT wait! Dave is never a bad show. Never! Even when he plays a more mellow or subdued set list, it still rocks. I can’t remember a show I didn’t like, and I’ve seen over 24 of them. We went to last years show in Raleigh, and have seen them in several other states. Front row, middle sections, acoustic shows, amphitheaters, stadiums and arenas. Never a bad show! This year we are going with some good friends of ours, and looking forward to a great time. We are carpooling up to Raleigh together, staying at the same hotel, and then heading to the show together to tailgate and enjoy some DMB. A few other friends will be joining us for some tailgating, so it will be a great time had by all. DMB is such an awesome atmosphere. If you’ve never been to a DMB show, I highly recommend it. And this year will be similar to last year, where there is no opening act. 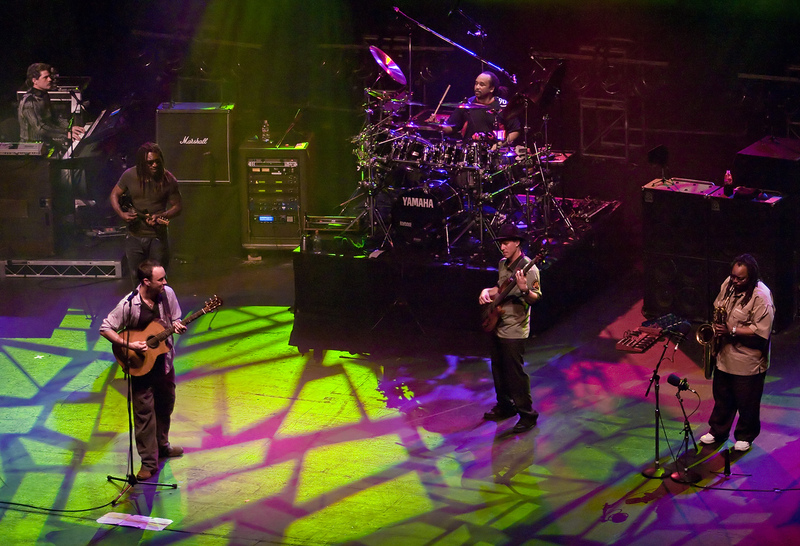 It is only DMB. They play an acoustic set first, and then come back on for an electric set. They may have special guests join them, but they don’t have a opening act. They are their own opening act. And they are AWESOME! So if you are in the Raleigh area on May 22, let me know and maybe we can all party together for a great evening of good friends and great music! Who is your favorite band? Are you a roadie? Seen them more than once? I’m into my final week of 1/2 marathon training. My run is coming up on Sunday, May 3. I’m not really worried about it, not stressing or anything. I’m just thinking now I wish I had someone to run with, to push me and make sure I make my goal time. I feel like I can do it solo, as I’ve been training at a faster pace than what my plan calls for (+/- 10 to 15 seconds pace per mile faster), so I feel like I can do it. My only small concern now is the mental behind it. I can easily persuade myself to not do things, cut runs short, etc. I haven’t done that this training session, nor did I for my marathon. So, I’m pretty sure I won’t have an issue, but with the lonely portions of the course I know are going to be out there, it would be easier running with someone. Anyways, I’ll let you all know how it goes. I’ve only got 4 days of running this week, including the 1/2. I feel like I’m ready, legs strong, I just need to make sure I get a good meal on Saturday night. Maybe a beer or two. Worked for me in Savannah. And then I will take a few days off, recover, and then keep my base miles conditioning going until I start my full marathon training in mid-June. So, down the stretch I come. And that is quite fitting considering this weekend, Saturday night actually, is the Kentucky Derby. Such a great event. I’ve never been, but I have a childhood friend who goes every year and says it is absolutely an incredible event. But since I am not there, we will have to simulate it as best possible. 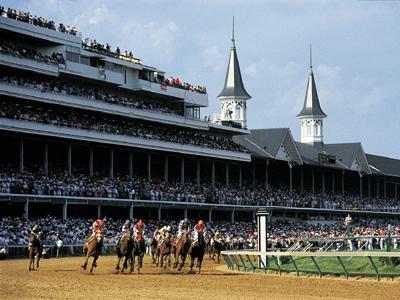 We typically watch the race on tv, make some wagers on which horse is our favorite, and even make a bunch of appetizers sometimes to enjoy while watching, sort of like the Super Bowl, except for the race is only 2 1/2 minutes long. My wife is a HUGE horse lover, so she enjoys just watching the march out to the track, to see all the pretty horses. I’ve ridden a horse once, and they all look similar to me, so I bet on odds, not the color and how they look. I’ve also got some yard work to do this weekend, cleaning the pool and getting the cover off and all the filters clean and ready for swimming. Bookworm has 2 soccer games Saturday, so our day will be spent mainly at the soccer field, but there should be enough daylight to give me a few hours Saturday afternoon to get the pool ready for action. We spent this past weekend fairly busy. Friday night was a little league baseball game for Statman, which ended in a 15-4 victory. He was 1-2 with a single, a strikeout and a walk. Then Bookwork, Statman and I volunteered through my company for Work on Wilmington. 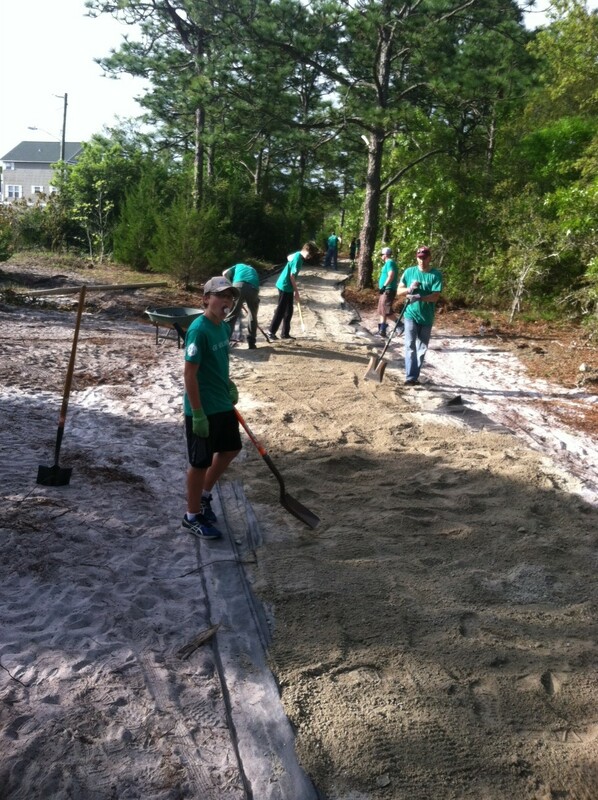 We assisted spreading gravel on a new fitness trail at Carolina Beach State Park. This will be a nice path once it is completely finished. The rest of the day we spent laying around the house relaxing, as it was overcast and dreary and we were tired from being up early and working hard. Statman did more running of the trail than working, but he had fun nonetheless. Saturday night ended with pizza and a movie for the boys before we all went to bed fairly early. Sunday was work day around the house. We did some cleaning, picking up, some light laundry, and then went to the Wilmington Hammerheads soccer game later in the afternoon. It was a good game. 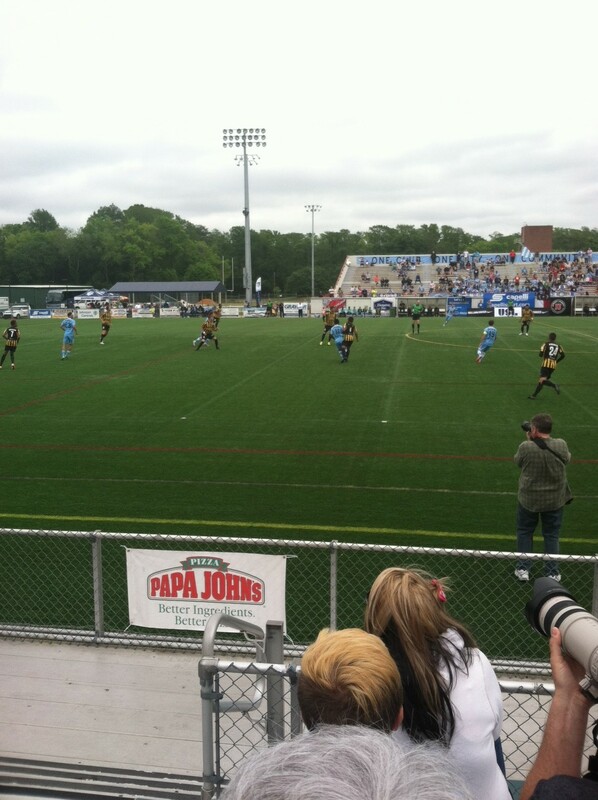 The Hammerheads lost, but it was still fun to watch. Being that close to semi-professional (USL) soccer was great, and it showed the boys how fast and how good these players really are. Takes some hard work and lots of practice to get that good. Wife was in Nashville, TN for the RNR 1/2 marathon and a girls weekend celebrating friends and a future bride’s bachelorette party. She had a great time, but we are glad she will be home today. We missed her lots. What did you do this past weekend? Any big runs coming up for you? Did anybody else run in Nashville this past weekend? I’m into my final 2 weeks of training before the 1/2. Been a good past couple of weeks. Been tough. Some very hard speed workouts included in my training plan by my amazing coach Kelli (and she happens to be my wife – she’s amazing at that too). I have to say, I’m not a fan of 4 x 1 mile repeats at 8 minute mile pace. I hate strongly dislike them. I haven’t really done speedwork before. I usually just start running, and if I pick up the pace to faster than what I start at, I feel satisfied with that. But, I have a goal for this 1/2, so I’m doing speedwork, as recommended by my coach. I’m getting it done. I’ve had some more aches and pains than before, but I’m working through it. I think I will be well prepared for my run in just under 2 weeks. I hope it’s a good day. As for my workouts, I’ve completed 87 miles in April, and 86 miles in March. I started this training plan March 9th. I think I’m ready. I’ve already completed a mock race at race pace, and achieved my goal time. So, as long as I can re-simulate that effort, I will be fine. Only difference is I probably will not have anyone to run with, which I believe helped push me to that faster time. It will be much harder mentally on me, but I’ll give it a go. Outside of my running, we’ve been spending most of our time with the boys at their respective sporting events. Statman is playing baseball. He has 2 games a week, on weeknights, at either 6 or 7:30. Bookwork is playing soccer, and he has had a game every Saturday, but 2 practices a week, usually on Tuesday and Thursday nights. And Bookwork has started attending a church youth group on Wednesday nights. This keeps us quite busy with our weekly schedules. I didn’t even mention the STRIDE coaching my wife leads at Statman’s elementary school twice a week, and my wife’s IRONMAN training schedule. Our calendar is a mess with activities, mainly written in pencil so we can move them easier without covering up the calendar in markouts or whiteout. The RED SOX are in full swing. Currently in 1st place in the AL EAST. It is way too early to be celebrating anything, as they only have 149 more games to play before the playoffs. But watching them start the season in first place is good to see. Clemson football concluded spring practice. Lots of good reports from camp on how the team will be. Lots of uncertainty in the defense and the O-line. Hoping for a healthy summer and a great start to fall camp. 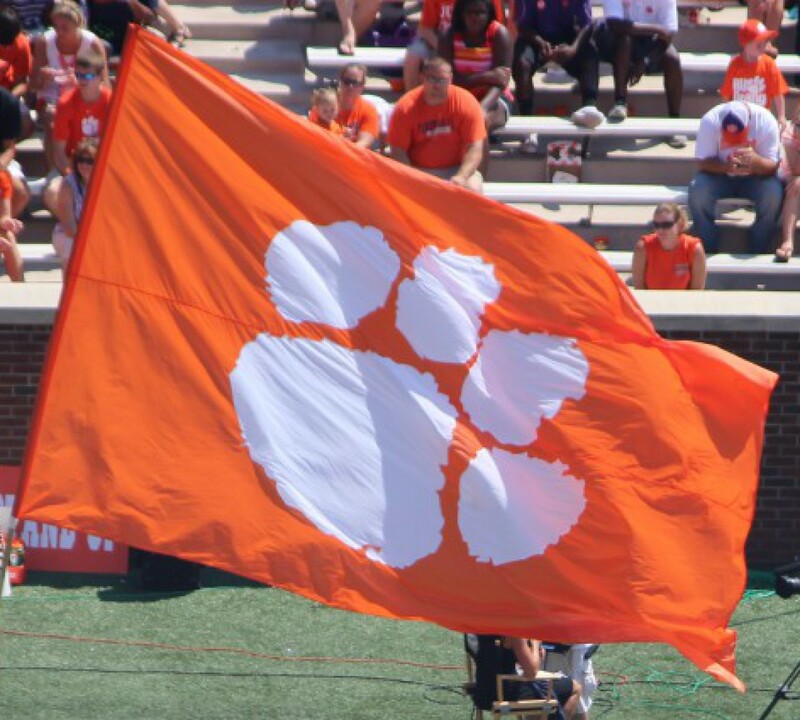 We will be there in Clemson in late May as Statman is attending the Clemson University Dabo Swinney football camp. That will begin our EPIC summer and fall of 2015. And there will be more to come in our EPIC-est year, so stay tuned. My wife and I watched the Boston Marathon yesterday. I had to stream it online, as nowhere here in Wilmington actually showed live coverage, so I had to connect the laptop to the tv, and the laptop to an exterior speaker, to be able to watch it comfortably. 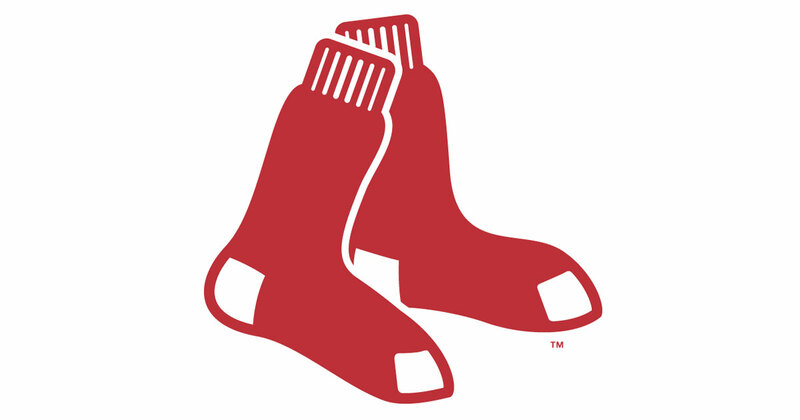 And with it being Patriot’s Day, and us Red Sox fans, we were planning on having the PIP on the tv set to the Red Sox game on the MLB Network. However, since we had to rig up the internet streaming thru the tv, I couldn’t use the PIP feature on the tv. And the MLB Network opted NOT to show the Red Sox game, so I had to keep tabs of it on my CBS Sportsline app. And we didn’t have any beers watching either, which would have been nice, but we had to coach the STRIDE group later in the afternoon, so it was just watching. It was fun, good to be home and enjoy the marathon viewing with my wife, even with all the failures I experienced trying to watch multiple things. Oh well. I’ve never watched a marathon in its entirety on tv, and since we were in Boston for the marathon last year, it hit home a little more. It hit home closer to my wife than I, but it makes us both want to return to Boston sooner rather than later. I’m glad it was a good race to watch. The American’s did well, but this just wasn’t there year. Maybe 2016. And as the athletes from the marathon and all other sports move on to their next adventure, so do we. We have lots planned for 2015, starting to plan 2016, and possibly further, so stay tuned to this blog, as well as to my wife’s, and enjoy the adventure with us. 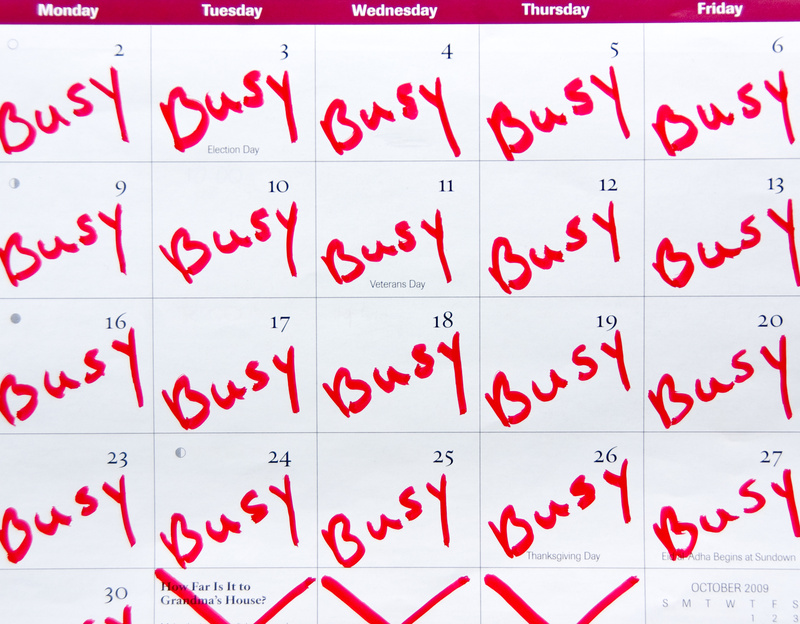 What are you doing the rest of 2015? Any EPIC events planned? Did you watch the Boston Marathon?